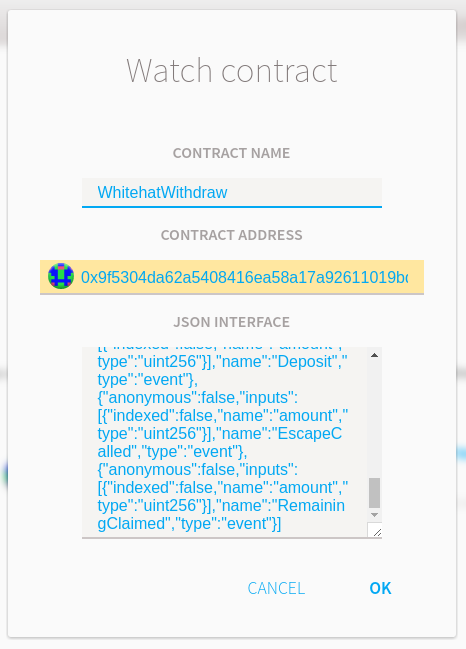 According to Whitehat Withdrawal contract - Update and Next Steps and Whitehat Withdrawal contract - Last update before deployment, the Goodies will be deploying the withdrawal contracts whetcwithdraw.sol, authorized_addresses.sol and whauthorizeaddress.sol to facilitate the withdrawal of Classic Ethers (ETCs) based on your The DAO tokens DAO balance at block 1,919,999 just prior to the hard fork. How do I use these contracts to withdraw my Classic Ethers (ETC) from the withdrawal contract? [THIS] How do I convert my The DAO tokens into ethers on the Ethereum Classic chain? There are only 3 more days to withdraw your refunds from the WhitehatWithdraw contract. There are still 1,651,062.7506 ETC (USD 4,292,763.15) remaining in the withdrawal contract. 87% of accounts have NOT withdrawn their refunds. Check this spreadsheet to confirm that you have withdrawn all your refunds. The latest instructions can be found at The DAO Refunds. 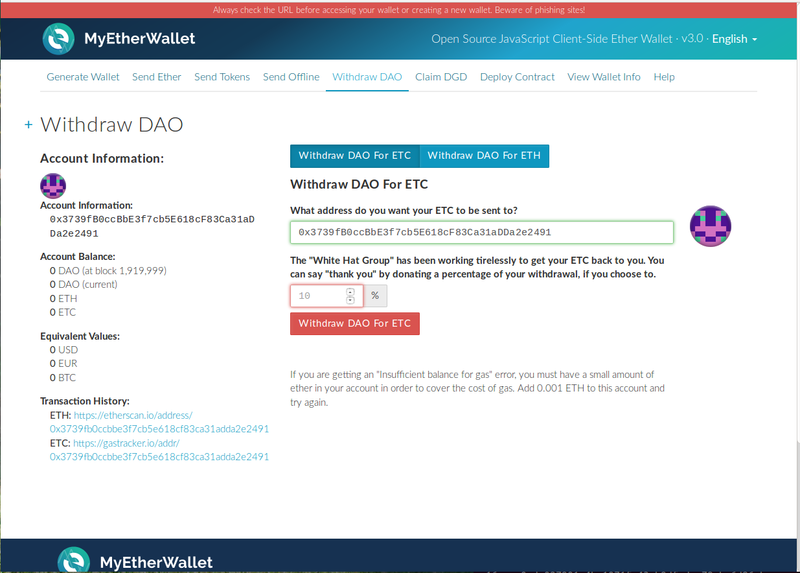 As documented in DAO Token Holders, Come Claim Your Money!, MyEtherWallet will be discontinuing support for withdrawing ETCs after Jan 1 2017. A new version of MyEtherWallet has just been released with a Node Switcher. DAO to ETC withdrawals can still be executed by switching to MyEtherWallet's ETC node, but support for the ETC node will cease in the next month. Please note that ETC transactions will be replayed on the ETH chain. As mentioned in the release notes, move your ETH balance to a new address before executing your ETC transactions! You can also download the old v3.37 version of MyEtherWallet and execute your DAO to ETC withdrawal with replay protection, but again MyEtherWallet is intending to cease support for their ETC node in the next month. The Whitehat Withdrawal Contract has been extended for 2 months until Apr 15 2017. If there are no major objections or exploits found, the withdrawal contract will be deployed on Aug, 30th, 2016 at 17:00 CET. All the users will have 6 months from that day on to claim their refund. The withdraw contract will probably be topped up multiple times, since there is still another small DAO we are waiting to come out of its creation period and also some funds are held by exchanges. So people would need to claim the remaining of their portion each time funds are sent to the contract. We are also actively working with exchanges to resolve the issue of frozen funds and will post an update as soon as there is new information so these funds can be added to the withdraw contract as well. After 6 months, all remaining funds will be sent to a multisig controlled by the whitehat group and will either be kept as donation for the efforts they have done to bring this value back to the token holders or donated to community developments. The 6 month expiry is 24 week from the deployment of the withdrawal contract. All remaining funds will be removed from the withdrawal contract on Feb 13 2017. Execute your withdrawals before this time if you want to claim your ETCs. The #withdrawal_support channel on thedao.slack.com has been created for users to get (and give) support on the withdrawal contract process. And donation addresses for the Goodies are 0xf63d257fc3576f9736fd9014cf0f0e1f0e7dd531 on the ETH chain and 0xe79aca5c8cda44d834efa969906a377cb987e02e on the ETC chain. At 07:02 Sep 4 2016 UTC, there are 2749352.9709 ETCs remaining in the withdrawal contract at 0x9f5304da62a5408416ea58a17a92611019bd5ce3. About 60% of available funds (6971038.6892 ETCs) have been withdrawn. At 15:05 Sep 6 2016 UTC, there are 2697281.1240 ETCs remaining in the withdrawal contract. About 61% of available funds have been withdrawn. And the Baddies will have access to 3641694 ETCs in 7 hours. Hey ... if the attacker is here and reading the slack ... you would become a hero and end this DAO chapter beautifully if you deposited all the ETC you just got in to the withdraw contract for the DTH to retrieve. Use function deposit() on address 0x9f5304da62a5408416ea58a17a92611019bd5ce3 with msg.value being the amount of ETC. You can check the amount of ETCs paid out, the amount of ETCs you can withdraw, and withdraw the ETCs (you have to provide a signature for this - see Method 5 below) at https://whwithdraw.bity.com/ . You can check your account's DAO balance at the pre-hard-fork block 1,919,999 in theDAOTokenBalance_20160819_155742UTC_balance.xlsx. You can check your account's ETC balance and transactions using the Classic chain block explorer at https://gastracker.io/. Method 1 - Withdrawal With MyEtherWallet This is the easiest method to withdraw your ETC. Point your browser to https://www.myetherwallet.com/#the-dao (IMPORTANT to use this correct URL as there are phishing sites popping up every day). See also the Jan 4 2017 update above. Method 2 - Withdrawal With Ethereum Wallet On The Classic Chain Sync Ethereum Wallet 0.8.1 (NOT 0.8.2) to the Classic chain and execute the WhitehatWithdraw.withdraw(...) function. Method 3 - Withdrawal With geth On The Classic Chain Sync geth 1.4.10 or later with the --oppose-dao-fork option and execute the WhitehatWithdraw.withdraw(...) function. [CLOSED] Method 4 - Providing Your Signature Of Intent On The ETH Chain For The Goodies To Execute Your Withdrawal - For Wallet Contracts Only Sign your intent for the Goodies to execute the withdrawal on your behalf by signing a message on the hard-forked Ethereum chain. You then don't have to sync with the Ethereum Classic chain. This signature needed to be executed before Aug 30 2016 at 17:00 CET when the WhitehatWithdraw contract was deployed. Method 5 - Using sign() for the Whitehat Withdrawal On The ETH Chain - For Non-Wallet Contract Accounts See How To Use sign() for the Whitehat Withdrawal for further details. Note that you have to create a new signature for each new withdrawal, even if you are specifying the same parameters (from @jbaylina in the thedao.slack.com/messages/withdraw_support). Method 6 - Using WHETCWithdraw From A Mist Contract On The Classic Chain See Using whetcwithdraw from a mist contract. Your addresses must be all lowercase as these were used in the creation of the mapping keys in the withdrawal contract. Use https://convertcase.net/. As suggested by @kirkdameron, @lunejy and @bocrypto on the thedao.slack.com/messages/withdraw_support, you can create a fresh new account on the ETH (or ETC as the accounts are the same) chain, and use this new account as your _beneficiary account when you execute the WhitehatWithdraw.withdraw(...) function. In MyEtherWallet you can specify your new accounts as the ETC destination address. Don't use this new account on the ETH chain. You are now safe from the transaction replays. You may want to transfer your ETCs after you have withdrawn them. To prevent the replaying of your ETC transfer transaction on the hard-forked ETH chain, see How to conditionally send ethers to another account post-hard-fork to protect yourself from replay attacks . REMEMBER THAT THERE WILL BE MORE ROUNDS OF REFUNDS - when the Goodies top up this withdrawal contract. Check the https://thedao.slack.com/messages/withdraw_support/ forum and https://www.reddit.com/r/ethereum/ periodically. I'll update this page as well. 21:26 Aug 31 2016 21:26 Kraken has deposited the frozen funds into this withdrawal contract. You can check the amount available for withdrawal using the "Calculate withdraw" function in the Ethereum Wallet, or using the whitehatWithdraw.calculateWithdraw(myAccount) function in geth as documented below. 03:00 Sep 1 2016 UTC Poloniex has deposited the frozen funds into the withdrawal contract. 08:36 Sep 1 2016 UTC Bonus geth + bash script to show you the Whitehat Withdrawal amounts paid and outstanding for your account - see the bottom of this answer. 01:38 Sep 7 2016 UTC Whitehat Withdrawal Contract - Final Deposit is Available. The withdrawal contract has had it's final top up of 269,566.58 ETC (from childDAO #101) and 1,199,777.62 ETC (from converted ETCs) - you will need to execute the withdrawal process one last time. Nice work overall Goodies! Details based on the contracts in github at 16:01 Aug 27 2016. Update Jan 1 2017 - MyEtherWallet will be discontinuing ETC withdrawal support after Jan 1 2017. And MyEtherWallet's donation address is 0x7cB57B5A97eAbe94205C07890BE4c1aD31E486A8. You will need Ethereum Wallet 0.8.1 to use the wallet on the Classic chain. Note that Ethereum Wallet 0.8.2 will NOT run on the Classic chain but instead prompts you to download the tools from https://ethereumclassic.github.io. When you start Ethereum Wallet 0.8.1, it will ask you "Do you want to activate the chain in which funds linked to the exploit are restored to a contract where they can be withdrawn by The DAO token holders?". Answer No to use Ethereum Wallet on the Classic chain. Ethereum Wallet will then instruct the packaged geth executable to download the Classic chain with the --fast automatically. You may also be asked whether you want to download the new version - just close the dialog box. See How do I sync the Ethereum Wallet and/or geth to the Ethereum Classic chain without affecting my hard-forked Ethereum chain? for instructions on running the Classic chain beside the hard-forked chain - at different times. The amount you have already been paid by entering your address in the Get paid out section on the left hand side of the screen. The amount available for withdrawal by entering your address in the Calculate withdraw section on the left hand side of the screen. On the right hand side under Write To Contract, select function Withdraw. In the beneficiary field, enter your address. In the percentage whg field, enter a number between 0 and 100. 0 means that you are not going to make any contribution to the Goodies for their hard work reclaiming the ethers from the hacked The DAO contract. 100 means that you are going to donate all your ETCs to the Goodies for their hard work. In the Execute From field, select the same address as you specified in the Beneficiary field. In the Send ETHER field, enter 0. This will prevent any transfer of ethers if/when the transaction is replayed on the hard-forked-chain. Click EXECUTE and enter your password to unlock the selected account. The ETC balance on your address should be deposited with ETCs in proportion to your The DAO token holding multiplied by the percentage of funds the Goodies have reclaimed. Your Ethereum Wallet address balance should update with the new balance. See the Authorizeaddress section of Whitehat Withdrawal contract - Update and Next Steps if you want you used a Wallet Contract to hold DAO tokens just prior to the hard fork. This signature needed to be executed before Aug 30 2016 at 17:00 CET when the WhitehatWithdraw contract was deployed. Here is a script to check your Whitehat Withdrawal balances. Save it into a file and see the instructions at the top of the file. # Cygwin bash shell installed. #   1. Download this script to getWHETCBalances . #   3. Run `geth --oppose-dao-fork console` in a window. #   4. Then run this script `./getWHETCBalances` in a separate window. # Enjoy. (c) BokkyPooBah 2016. The MIT licence. geth attach << EOF | grep "INFO" | sed "s/^INFO//"
And here is some sample report data from the script above. As queried by @Chevdor, the code using the Solidity Online Compiler using solc v0.3.5-2016-08-10-fc60839 matches the code deployed at the ETC address 0x9f5304da62a5408416ea58a17a92611019bd5ce3. I think it remains good practice to check any contract before running it. Is there a way to check that the contract at the address 0x9f5304da62a5408416ea58a17a92611019bd5ce3 is indeed coming from the source above? In order to verify that the contract deployed is indeed matching the source above, could you please provide the 4 parameters used to deploy the contract? Especially the "escape address" and the "remaining beneficiary" as well as what they do? As far as I can tell, the ABI coming from the source matches the one from this post except the removal of the fill method. So I DO now confirm on my end as well that using the right (nightly sic) version of the compiler (ethereum.github.io/browser-solidity/#version=soljson-v0.3.5-2016-08-10-fc60839.js&optimize=true) , the code at https://raw.githubusercontent.com/BitySA/whetcwithdraw/master/whetcwithdraw.sol matches the bytecode at the address 0x9f5304da62a5408416ea58a17a92611019bd5ce3. Not the answer you're looking for? Browse other questions tagged tokens the-dao ethereum-classic hardforks thedao-refund or ask your own question. How Do I Know If I Still Have Remaining DAO Refunds? Why Are My The DAO To ETH Refunds Failing? 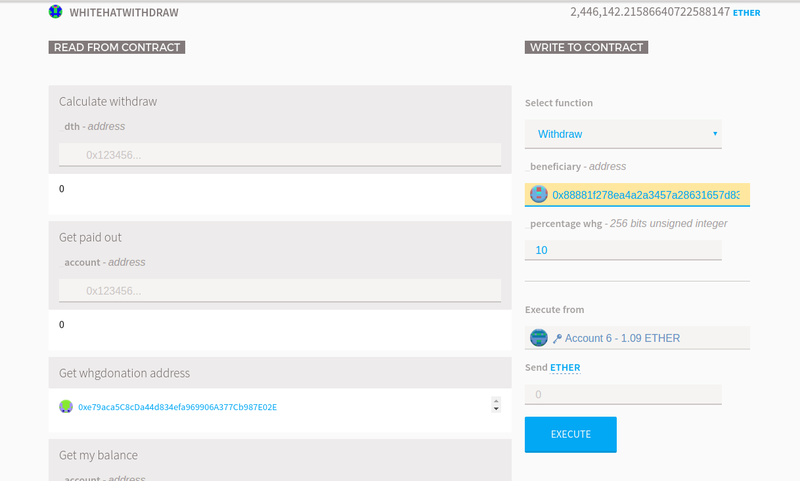 How to fix this problem with Ethereum Wallet in order to convert DAO tokens into ethers using the withdrawal contract after the hard fork?